Trafalgar Wharf, at Portchester in Portsmouth harbour, is to be the birth place of Project Nelson, a ‘Best of British’ modern take on a classic Gentleman’s Motor Yacht. 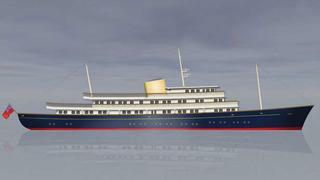 The facility which is currently leased by Shemara Refit LLP (for the refit of the 1938, 65m, superyacht MY Shemara) becomes available in June of this year, as does the design team and the production expertise and infrastructure that have supported the aforementioned unique refit; many of the SRLLP team have indicted their willingness to support Project Nelson and ship building at the site. Burgess Marine and Laurent Giles seek an enthusiastic owner, keen to be integrally involved, with an outstanding passion for all things ‘Best of British’. The project will be structured in an entirely unique fashion and will continue to challenge the conventional way of superyacht building. Project Nelson fully intends to utilise newly available local ship building labour and regional industry expertise; there is also the potential to utilise excess new build capacity within HM Naval Base Portsmouth. Ship building in Portsmouth is a huge part of British maritime history which Burgess Marine and Laurent Giles remain eager to protect and enthused to re-invigorate. Initial design work has been undertaken by Laurent Giles.